Not every gas fire is suitable for the home. In order to choose the ideal gas fire or fireplace for your home, you have to know what type of chimney or flue you have, and what you want from your gas fire. Flue type is the most important starting point, as this determines the depth that you have available for you insert gas fire. 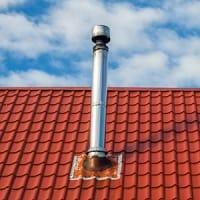 There are six main flue types, and each can be determined by simply looking at your roof. The Classic brick built chimney is suitable for all gas fires and stoves in this website. As these chimneys are deep you can choose a full depth fire through to the shallow slimline products. Also suitable for most solid fuel appliances. 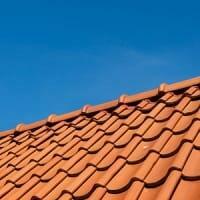 A brick chimney is recognised by a chimney stack, with either a pot or gas terminal on your roof. Also you will have a chimney breast either inside the room or on the outside wall for the fire to fit into. The diameter of the flue is a minimum of 7" (175mm) or greater. 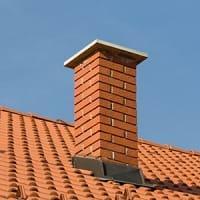 The brick built chimney or a 7" flue liner is also known as Class 1. 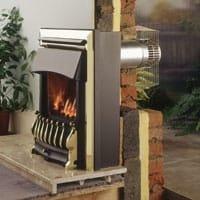 Pre-fabricated flues are suitable for most gas fires and gas stoves. Prefabricated flues offer a good depth so you can also choose from the majority of full depth fires and all slimline fires. Pre- fabricated flues are found either in older houses where the existing Chimney has been lined by a steel flue or a newer house with a steel flue built in and is recognised by a metal flue and terminal on the roof. The diameter of the flue is a minimum of 5" (125mm). Some older houses where the brick chimney is unsafe will be lined with a 5" (125mm) flue. A pre fabricated flue with a minimum diameter of 5" (125mm) is also know as Class 2. Pre-cast flues are found in most modern homes and suitable for a wide range of slimline gas fires. Pre-cast flues are recognised by a ridge vent or metal flue terminal on the roof. The Flue is constructed from concrete or clay blocks they form a rectangular section flue and are very shallow in depth. A balance flue is a glass fronted gas appliance which vents directly through an outside wall. 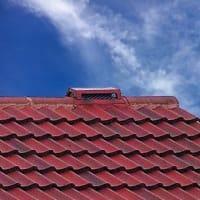 Used where there is no chimney or flue available. No mains electricity required. Flueless appliances use a catalytic converter which converts all harmful gases to carbon dioxide (safe gas) and water vapour. These can be installed into most rooms providing there is a gas supply excluding bedrooms and bathrooms also the room needs to meet minimum size and ventilation requirements. Flue information should be used as a guide only. A professional fireplace survey is recommended prior to purchase/installation.